Golf committee volunteers and support of local businesses help to ensure a successful event. Bob Allen (centre), flanked by wife, Ruby and daughter, Heather. The highest honour that can be bestowed upon a Landscape Ontario member was presented to Bob Allen at this year’s Landscape Ontario Awards of Excellence ceremony on Jan. 8. 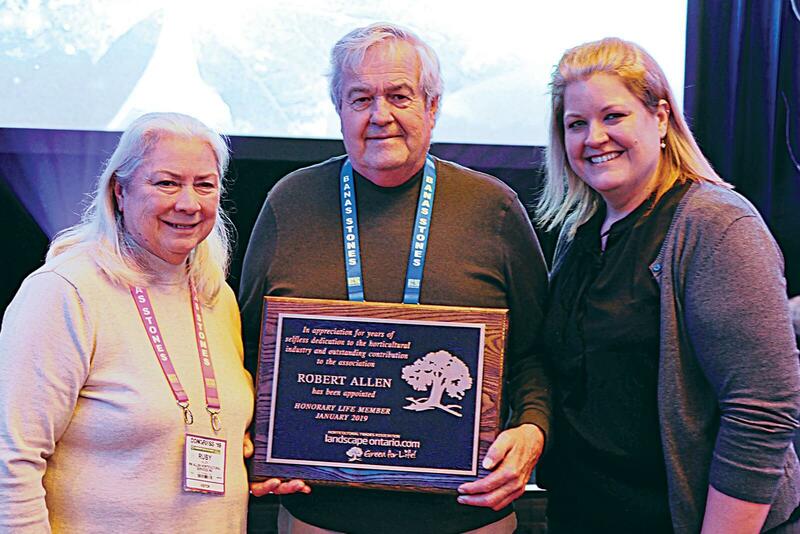 Allen, along with Ottawa Chapter founder, Jim Bauer, was given an Honorary Lifetime Membership Award for his longstanding volunteer contribution to both the association and to furthering the advancement of the profession. Allen became a member of Landscape Ontario’s London Chapter back in 1975, a year after starting Bob Allen Horticultural Services. Allen held various positions within the chapter board, including treasurer and membership chair, and serving as chapter president in 1981 and 1991 and provincial board rep from 1982 to 1998. Allen served as LO president in 1985 and is currently serving as secretary on the Ontario Horticultural Trades Foundation board where he has participated for many years. Outside of the association, Allen has continued to volunteer and support other organizations throughout his career. He has been a board member of Communities in Bloom since 2007, was LO’s representative on the Ontario Farm Safety Association, serving as chair from 1993 to 1996, and been the Ontario rep for the founding of the Canadian Coalition for Agricultural Safety and Rural Health — a Canada-wide organization, of which he was chair from 1996 to 1999.